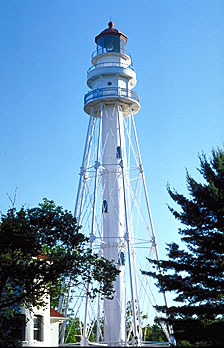 Rawley Point's 111 foot tower is topped with a two-story cast iron watch room and a ten-sided lantern. 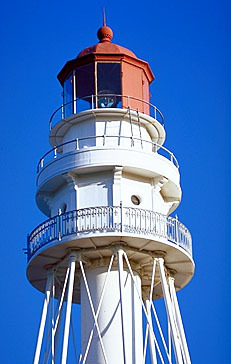 The original Third Order Fresnel lens has been replaced with a DCB beacon that is visible for up to 25 miles. The skeletal frame with a 6-foot diameter cylinder for stairs was built in 1894. Other lights at this site included a wooden tower in 1853, and a brick tower in 1874. The keeper's house was built at the same time as the 1874 tower. The site today is a Coast Guard residence within a state park. Views of the light can be obtained from the surrounding beach area, but the h ouse and grounds are not open.